Start Bay is a huge bay that consists of many beaches – some big and some small. Located just five miles south of Dartmouth, you will find ample parking and short walks to where you will fish. 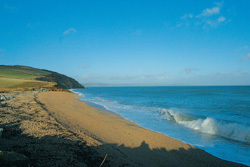 The area consists of six top marks spread over three beaches – Hallsands, Beesands and Slapton. These beaches are known to throw up anything over the winter, from small pouting, dogfish and whiting to huge 20lb-plus cod. There are target times and areas but don’t think that’s the only time to fish. Don’t be shy of taking a good variety of baits and putting in some hours – you will be rewarded in the end. All the beaches are east facing and will fish exceptionally well after an easterly blow. As a general rule of thumb, during daylight the beach usually fishes best on the first two hours of flood but during the night it will fish best two hours over the top of high water. A decent session will include all six hours of the flood and the first three hours of the ebb. Find the A379 leading from Dartmouth to Kingsbridge. Leaving Dartmouth and heading south, the first three marks you will find are on Slapton. Once past Slapton watch out for signposts on the left-hand side saying Beesands and Start Point. This will lead you to the last two beaches and the final three hotspots. Follow the A379 south of Dartmouth and when you have gone through all the villages and have finally come out on the Slapton straight, the first mark you will come to is Strete Gate. Here you will find the shallowest end of the beach. Dab, whiting and plaice are the main target species here but it does throw up the odd small cod. Use lugworm and squid on a three-hook, clipped-down rig and bang it to the horizon. Further on down the A379 you will find a car park with a war memorial at one end. This section of Slapton is known to local match anglers as ‘The Memorial’ for obvious reasons. This is the deepest part of the beach and a general rule here is that you will catch less fish – but bigger ones. Most of the big cod caught on these beaches come from The Memorial. Fish big baits on Pennell rigs for the cod and combination baits on three-hook flapper rigs for the other species. This is the last mark that the main beach of Slapton has to offer. Travel further south down the A379 and you will find another car park with a WW2 tank at one end – hence the name. The water at this end of the beach is of a medium depth compared to other parts. At the end of the beach you will find a small cliff. Directly out from here is an area of broken ground, which can throw up anything. 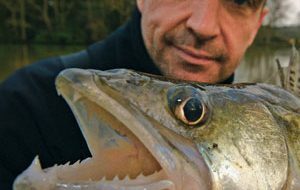 Dogfish, whiting, pouting, plaice, dab and the odd codling are on the menu. Fish cocktail baits on three hook rigs and don’t be scared to cast closer in than normal. Finally, leaving Slapton, you turn off the A379 and head for Beesands. At the north end off the beach you will see a small football pitch. The area of beach opposite is known as The Rovers end after the local team. Fish the flood tide here and on the right conditions you will catch many species, especially plaice and dab. Yet again, fish three hooks and cocktail baits. If you want to catch a decent plaice then this is your mark. The southern end of Beesands is known as The Cricket Inn End – named after the local pub that is situated there. This is the deeper end of the beach. Yet again, you will catch many species here but this area can often throw up a better fish after dark. 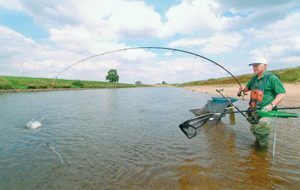 Fish two rods – one with a Pennell rig and big bait for the larger specimens and one with the standard three hooks and cocktails for the various other species. Travelling south again, this is the last beach you will reach before leaving Start Bay. Hallsands is smaller than all the other beaches but don’t be put off. The beach is shallow and worm baits seem to work well. Plaice and early-season bass are the target species. Fish three hooks and combo baits for the plaice and single-hooked worm and sandeel baits for the bass. Note: Hallsands is the worst beach of all three for dab, so don’t go there if you want to bag up on the flatties. Devon Angling Centre, Unit 4-5, Orchard Meadow,Orchard Way, Chillington, Kingsbridge, Devon, TQ72LB, Tel: 01548 580888. It’s a good idea to go for a tapered shockleader when fishing these beaches, especially after a blow when weed can be a problem. Sandeel fished on a Pennell rig will help when targeting the larger specimens as well as the dogfish!